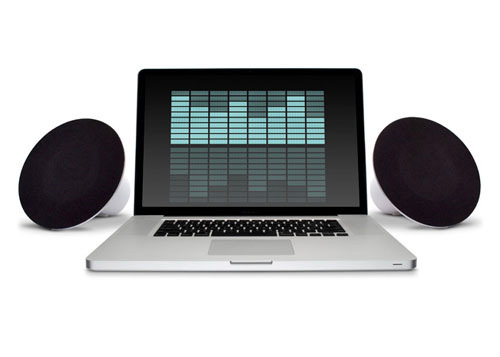 Accessory and peripheral maker LaCie has announced its new Sound2 Speaker system designed for use on Macs, PCs, or any other A/V device (like, say, a media player) that needs some premium quality audio output without a ton of bells, whistles, and blinky LEDs. The Sound2 Speakers look like just a roudn grille that balances on a desktop, but connect up using USB or a line-in port and pump tunes with up to 30 watts of power. The Sound2 Speakers were designed by LaCie favorite Neil Poulton, and the company partnered with French high-end audio company Cabasse to dial in the loudspeaker technology. “At LaCie, we like to optimize how our customers interact with their media. It is very exciting to partner with a company like Cabasse, which has a sixty-year reputation for hi-fi sound systems, to offer a high quality listening experience to our customers,” said LaCie product manager Alexis Kobassian. 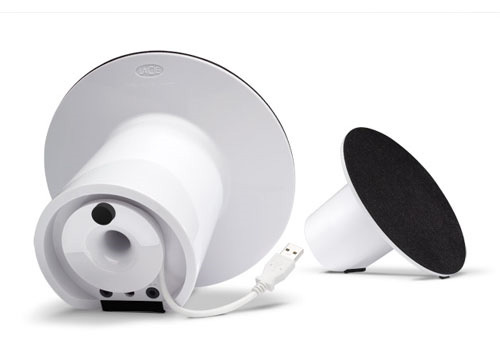 The Sound2 Speakers feature USB or line-in input (no drivers required for USB connections) and a Class D digital amp with a total peak output of 30 watts. The speakers incorporate bass reflex technology for low end response, and LaCie claims the drivers handle frequencies from 80 Hz to 20 KHz. Of course, the speakers aren’t pulling 30 watts of a USB port: the system comes with its own external power supply, so this isn’t exactly a portable speaker system. The loudspeakers are magnetically shielded to avoid interfering with nearby phones, displays, and computer gear. The Sound2 Speakers will be available from LaCie and selected partners at a suggested price of $99.99.